How to Enter: Send me an e-mail sharing the most encouraging words someone ever spoke to you, or an act of kindness that lifted your spirit. 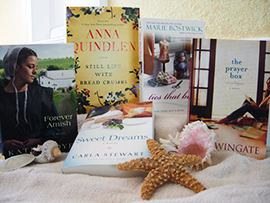 Your summer reading fare includes: Sweet Dreams by Carla Stewart, Forever Amish, signed by author Kate Lloyd, The Prayer Box by Lisa Wingate, Ties that Bind by Marie Bostwick, and Still Life with Bread Crumbs by Anna Quindlen. When our grandkids, Ethan and Emma, came for the weekend we looked for something new to do with them. We decided to visit a low spot at a nearby river. On the grassy bank the kids' kicked off their shoes, yanked off their socks, and splashed into the water. Loren and I watched Ethan take careful aim and pitch a stone, then count jumps as the rock skimmed the water's surface. "How many skips can you do, Grandpa?" The rest of us searched for the smoothest rocks we could find to meet his challenge. We also made rock towers and of course the race was on to see who could build the tallest tower before it toppled over. Relaxing by the river's edge, we admired the shapes and colors of the rocks. When Loren said it was time to go he was met with "Ah ... do we have to?" "Your folks are coming to pick you up soon," I said. We drove from the parking area with promises to return another day. I squeezed Loren's hand and whispered, "free entertainment." Readers Share their Summer Fun! Susan - In summer when it's a hot night I love to float in the quiet of my pool. All alone listening to the crickets. Dawn - I love to walk along the beach, just close enough for the water for it to wash over my feet, and talk with the Lord, my hubby or a good friend. I prefer to take these walks early in the morning or as the sun is setting and the beach is not as crowded. Michele - We spend the summer going to our son's baseball games - which is good because it gets me outside, and I love baseball, and I get to read between games and going to and from games! Betty - I live near the Great Smoky Mountains National Park and my favorite summer activity is exploring the park and enjoying the beautiful mountains. Dianne - We stay at home and produce as much food in our garden as we can and then preserve it so we have it all year. Right now we are canning stewed tomatoes. We have been married 38 years and have a lot of fun being alone together at home. Cindi - My favorite summertime activity is camping with the horses and trail riding. It's such a blessing to be able to enjoy all of God's beauty from the back of a horse. Donna -I enjoy piecing quilts in the evenings and spend weekends fishing with my husband, and spending time with family & friends. Pat -I used to Hate summer. Allergies prevailed just at a season I had no excuse to stay in. They have abated and I'm so glad to be older and able to enjoy this gorgeous season of full blossoms and luxuriant leafage at their richest time. Weeding gets me very close to abstract shapes and exquisite textures of many living things! Walking is without extra needed clothes, smelling wonderful fresh breezes and seeing lovely clouds. Only in this season does snow leave the highest trails and allow heights and sights to inspire for all year to come. "For the Beauty of this Earth" is something I can now celebrate in this special season of summer. Sue - I enjoy sitting and reading stories to my grandchildren whereas my husband loves to make up stories and 'spider' with them. He wriggles his hand and they screech and slap at him and then laugh together...it takes all kinds doesn't it?! 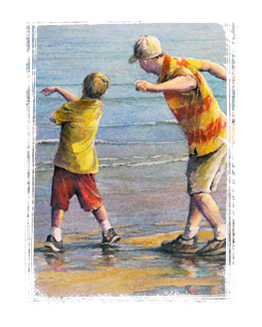 Kristin - My favorite summertime activities~~walking along the beach~~reading novels, going to an outdoor concert, reading novels, cooking on the grill, reading novels, taking nature walks, and reading novels. Remove seeds from juice & pour into pitcher. Dissolve 1/2 cup sugar in ½ cup hot water. Stir until all the sugar is dissolved. Add 3 1/2 cups of cold water. Add to lemon juice & stir. Garnish with seeded lemon slices & sprigs of lemon balm. This summer Loren and I will explore part of the Oregon Trail. Using a copy of journals recorded by Loren's ancestors, we will travel in their footsteps visiting locations where they stopped on their journey to the west. Whether exploring your ancestor's paths, driving to the next county to tour the cheese factory, or visiting a historical landmark, you may have plans to trek out on your own expedition during warm summer months. But if time and finances prevent you from strapping on your traveling boots why not do the next best thing? Choose your location, anywhere in the world. Pay a visit to your local library and checkout travel videos, music, cookbooks, etc. 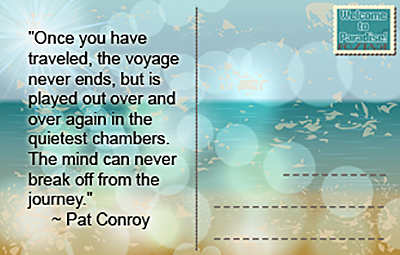 of your desired destination. When our kids were young and money tight, we traveled to Peru this way. We explored the mysterious ruins of Machu Picchu via travel video. Guided by our borrowed cookbook, we created and enjoyed eating an authentic Peruvian dinner. While our family never jetted away to the exotic locale, we did enjoy a little homemade flavor of South American music, culture, and cuisine.